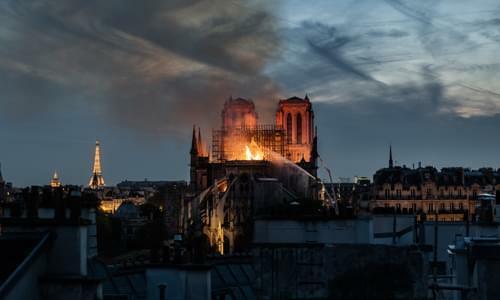 On Monday’s Mark Levin Show, Notre Dame Cathedral was on fire and authorities have all but ruled out arson and terrorism. They do expect to save the two main towers. Also, Rep Ilhan Omar and the Democrats have been inciting violence against President Trump since before he was elected. They’ve called Trump Hitler, Stalin, Mussolini, a White Nationalist Klansman, and more despotic terms. Now Omar claims that Trump’s tweet threatens her life. This is an effort by the Democrats and the media to prevent her from being criticized. Later, what is it about Marxism and socialism that attracts people? The diabolical genius of Marxist socialism is that it provides the emotional and intellectual roadmap for autocrats to persuade millions of people to support their own enslavement to government. This is why we fight for liberty and individualism. Then, our freedom of the press originated with a desire to keep the people informed in our process of defending our liberty. The political press was known as the party press and they were clearly known to be partisan, a practice that has sadly faded away; now our press parades around as objective when they’re nothing more than an arm of the Democrat Party. Finally, Dr Zhudi Jasser, President of the American Islamic Forum for Democracy, calls in to discuss the latest on Omar’s controversial statement trivializing the 9/11 attacks.